The studio in the capital’s main commercial district is led by director Robert Kaminski who feels that the opportunities for the practice in Poland and across Central and Eastern Europe have never been greater. “In terms of the economy and overall investment, this is a very exciting period for Poland and the wider region,” he said. “When Broadway Malyan decided to open its studio in Warsaw, it was very much one of Europe’s emerging economies and it was an investment based on our belief that Poland had the aspirations and economic fundamentals for significant growth in the years ahead. Broadway Malyan was originally founded in the UK in 1958 and the Warsaw studio is part of a network of 13 international studios, a network that allows the practice to provide a comprehensive service to all its clients and also helps the practice better navigate challenges such as Brexit. Mr Kaminski says: “Broadway Malyan is a truly international practice but it also still has half of its workforce in the UK, many of whom are from the EU; like many other businesses we are waiting to see what the impact of Brexit might be. “However, there are always global challenges, whether it’s a trade war between America and China or fluctuations in oil prices and exchange rates, these have to be managed and adapted to – it is the very essence of being a global business. Over the past 18 years, the Warsaw studio has designed and delivered a diverse portfolio of projects for a range of blue-chip clients in the retail, workplace, residential and master-planning sectors and it is currently working on an assortment of projects that reflect the growing optimism in the region – and the breadth of Broadway Malyan’s design expertise. Recently completed projects that are due to open in 2019 include EPP/Echo’s Galeria Mlociny project, where Broadway Malyan has designed an innovative new gastronomy zone and rooftop terrace and Immochan’s Pushkino, a new 100,000m2 GLA shopping centre in Russia. 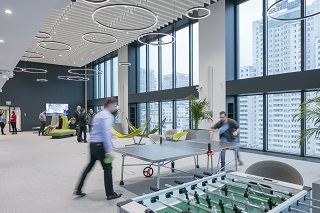 The studio also recently completed a major fit out project for Citi in Warsaw, the year’s largest commercial fit out in the city and it has since won a second commission in an adjacent building. 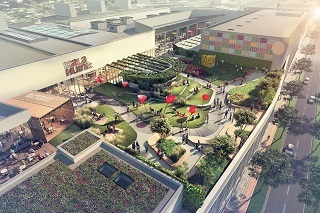 Projects on the drawing board include the extension and refurbishment of several shopping centres in Poland and Russia for various clients including NEPI Rockcastle and IKEA as well as the refurbishment of the historic Dom Towarowy Bracia Jabłkowscy department store in central Warsaw and large residential-led regeneration project in Lodz – all projects that reflect Poland’s upward trajectory. Mr Kaminski said: “In recent years investors have been acquiring well-priced assets and we are now using our international retail experience to help them reposition these assets with simple refurbishments or more complex extensions and ensuring they meet the expectations of the modern customer with the introduction with exciting and innovative new formats. “There has also been a steady interest in Warsaw and other Polish cities from international businesses who are looking to take advantage of Poland’s central location and increasingly skilled workforce to relocate their shared services and business process outsourcing operations, which is generating significant opportunities in the workplace sector.